The wraps were taken off Samsung’s Galaxy S3 smartphone this morning at a ceremony in London. The Galaxy S3 is expected by many to be the best iPhone competitor to date. The smartphone will have a big 4.8″ Super AMOLED Plus touchscreen. It’s thin (just 8.6mm) and lightweight (133 grams), and will pack a 1.4GHz quad-core processor. The S3 runs Google’s Android 4.0 (Ice Cream Sandwich) OS, and will come in 16, 32 and 64GB versions. Two cameras are included, one an 8 megapixel, the other 1.2 megapixel. According to Samsung, the phone will launch in Europe on May 29. That’s great for Europe. But how about those of us in the US? Well, we get a vague “this summer” as a launch date. Oh Well. As for what US carriers the Galaxy S3 will be launched on? Eh, no joy here either. We have to go to unofficial sources to get any ideas concerning US carriers. 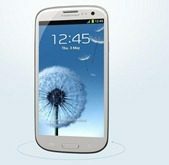 The Verge is reporting that Sprint will carry the Galaxy S3. Maybe others as well, but the only thing they have that is firm appears to point to Sprint. Samsung’s own site includes a form to sign up for the latest Galaxy S3 news – it includes a section to select a preferred carrier. All the major US carriers, and several regional ones, are included in the options. Does that imply the S3 will launch on all of them? Don’t know.